2012 was quite an interesting year for me as many family members and friends became parents. All of these children ,except of Alex Kevin and Florian, have at least one Bosnian parent. I am looking forward to the next years as a majority of them are first-time parents and will likely have some more children in the near future. And maybe you are wondering why almost no one has a middle name. The reason is that it is very uncommon to give children more than one name in Bosnia; although, I think it is a waste of a good naming opportunity. 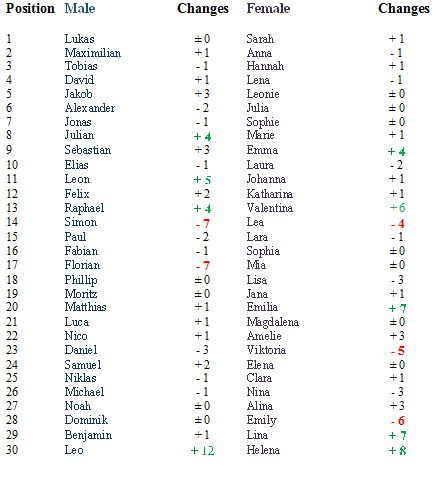 Also added here are some names of children born in 2011 as I never mentioned them in my blog before. The Statistik Austria released the official name statistics last month , but it took me some time to read trough it and analyse the changes. The official statics combines names with different spelling, but same pronunciation, like Hannah and Hanna. Here are most popular baby names in Austria.